Abstract: ASRock (a division of ASUS) is one of the better known, having made made a mark for itself by serving up inexpensive motherboards with basic amenities and good build quality. How many times have you done a little theoretical upgrade window shopping, only to find that all the motherboard brands you've never heard of are the ones within your budget? Companies like PCchips, Magic Pro, Acorp, Biostar, Jetway, and ASRock each crowd the value-oriented motherboard markets, but quality can vary wildly between them. Of these, ASRock (a division of ASUS) is one of the better known, having made made a mark for itself by serving up inexpensive motherboards with basic amenities, good build quality and reliability. The new ASRock 775XFire-eSATA2/A/ASR motherboard is based on the Intel 945PL chipset and supports ATi's dual videocard CrossFire technology, should you want that option. ATi has given its CrossFire blessing to the high end Intel 975X chipsets, but there has been no mention of CrossFire support anywhere else curiously. The ASRock 775XFire-eSATA2/A/ASR supports all current Socket 775 Intel Celeron, Pentium 4 and Pentium D processors (dual and single core) that run with a 533MHz or 800MHz FSB. 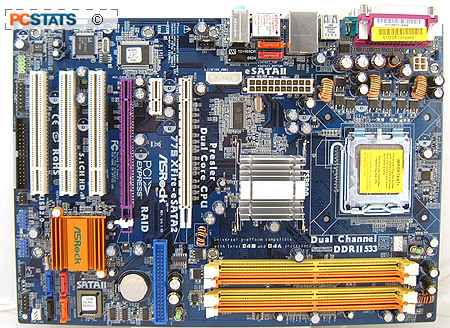 The ATX motherboard is equipped with four 1.8V DDR2 DIMM slots which accommodate up to 2GB of DDR2-533 (PC2-4200) memory, due to a four bank memory controller limitation. Memory must be installed in pairs for dual channel operation, so we'd recommend installing DDR2 modules of at least 512MB in size. Other hardware goodies include an 'Azailia' High Definition Realtek ALC660 5.1-channel audio controller and a 10/100 Ethernet network jack, and four USB 2.0 ports (plus two USB 2.0 headers) at the rear I/O. 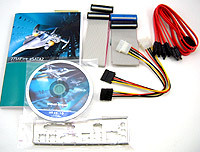 The ASRock 775XFire-eSATA2 A/ASR motherboard boasts support for two external Serial ATA II devices by way of a pair of rear-mounted external SATA2 ports as well. These two special eSATA jacks basically act as extensions for two internal SATAII channels, and there are four of those for hard drive expansion capable of transferring data at 3.0GB/s (incl. RAID 0, 1, JBOD). User's Manual, Driver CD, Ultra/133 IDE Cable, Floppy Cable, (4) Serial ATA Cables, (2) Molex to Serial ATA Power Cables, I/O Shield. In terms of peripheral expansion, users will find two physical PCI Express x16 slots which are ATI Crossfire Compatible (although the 2nd purple PCI-E slot only supports four PCI Express lanes), a single PCI Express x1 slot and three traditional 32-bit PCI slots for legacy hardware. On the whole, the ASRock 775XFire-eSATA2 includes a little bit of everything, while covering all the bases like sound, networking, and data storage. If there is one thing missing on the list of essential onboard expansion options, it's an extra ATA133 IDE channel; there is only one on the 775XFire-eSATA2 A/ASR. The ASRock 775XFire-ESATA2/A/ASR retails for less than a $90 CDN ($78 USD / £35 GBP) which makes it very price competitive. 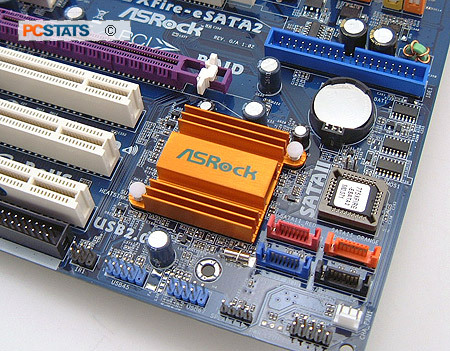 The user manual that accompanies the ASRock 775XFire-ESATA2/A/ASR motherboard is well detailed, and should guide you through the installation steps of setting up a system nicely. If you are confused, have a look at PCSTATS Beginners Guide on the subject for some pointers. And for those who have been stung by the burst capacitor problem in the past, this Asrock motherboard is equipped with KZG, LTEC and a brand identified with a capital M electrolytic capacitors. Let's hope ASRocks's commitment to quality parts is as good as its pricing structure and none of them burst 3 years down the road... pop! Up next, a closer look at the features of this ATX motherboard. Pg 13. A great value motherboard?